You are here: Home / Arts / Fake Ghost Tours 2 at the Victoria Fringe 2018. An interview. Not all shows at the Victoria Fringe Festival take place in a theatre. 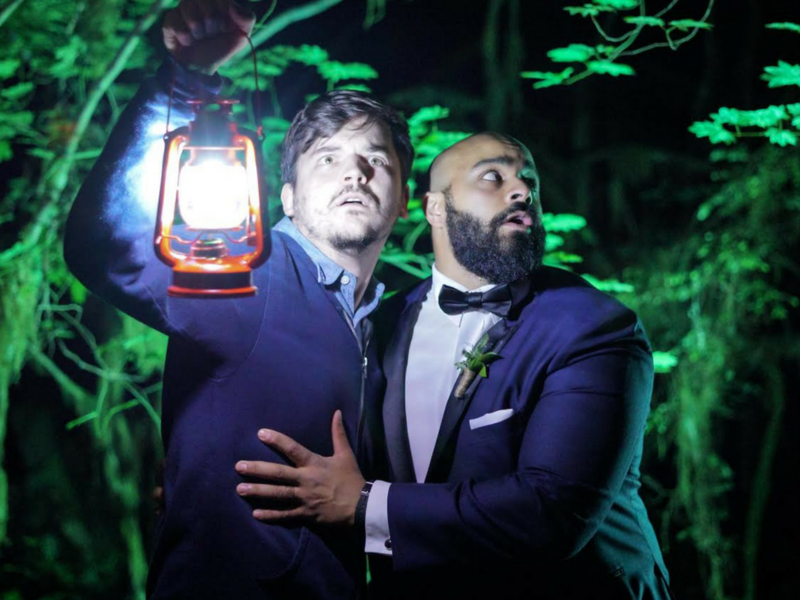 Local comedians Abdul Aziz and Shawn O’Hara paired up in 2017 for a comedy walking tour—the wildly-popular Fake Ghost Tours (of downtown Victoria) and they’re back this year. My recommendation—buy tickets in advance if you are planning on going. This show was a sell-out for its entire run in 2017. Abdul Aziz shared more about the show. This is the second year of Shawn and I doing Fake Ghost Tours but Shawn has been fringing with his Field Zoology 101 show for 3 years now. Not at all! Shawn is a Victoria native and I went to UVic. We’ve been writing together since we met doing standup comedy in 2013. Yes! We’ll be doing the Vancouver Fringe as well. It’s a totally new show. Completely different from the one we wrote last year (save for the characters themselves of course). In fact the comedy walking tour format itself is completely unique. We haven’t been able to find anyone else in Canada doing the same kind of show. We won Best Duo last year and got Runner up for Best Comedy at the Victoria fringe. And we were also selected by JFL Digital to develop the show into a web series. Shawn and I have been writing and performing together for about 5 years now and our process is VERY casual. In essence, we spend our writing sessions trying to crack each other up. The stuff that makes us laugh the hardest gets written into the show. Anyone who loves to laugh! I would say that they MAY see a ghost and short of that, they’ll DEFINITELY laugh a lot. Not that I can think of, thanks so much! Ghost hunting brothers Abdul Aziz and Shawn O’Hara return with a walking tour so accurate and frightening that you’ll wonder how you’d never heard these unquestionably true stories before. From the history of Victoria’s first ghost business owner to the city’s most haunted payphone, no rock will be left un-toured. Winner of Best Duo at the 2017 Victoria Fringe. Note, the meeting point for this show is in CRD Square on the Government Street side (near to the statue of Dr. Sun Yat-Sen). Shawn and Abdul met at Victoria’s Ratfish Comedy Show in 2013, swiftly becoming friends and writing partners. They have performed on stages across Canada, including JLF NorthWest, and appear together on the Spout Lore podcast.